Did you wake up early this morning? Twiddled your thumbs while the coffee brewed? Did you wonder aloud how else you could use these earlier mornings to speed you along the path to Diva-town? Well, as one who wants to provide food for thought and caffeine for the soul, here is just another option for those daybreak hours. Beyond practicing mindfulness, challenge yourself today – Day 13 – to become an interpretive baller, ahem, scholar. As humans mature, we become more aware of the cultural symbols that surround us and how we can use them to communicate more effectively in speech or in song. Young singers becoming more comfortable with solo repertoire often lack a full vocabulary of emotional expression. How often have you seen stock emotion and stock impression trotted out on stage time after time? Even with outstanding musical skills, it is apparent when vocalist has not spent enough time understanding the interpretation of a piece. Art song deserves even more dedicated focus in terms of interpretation because they often deal in subtlety. Whereas, opera arias are more like monologues in which the character is presenting their feelings and thoughts in a more straightforward manner. Interpretation study is a valuable and necessary part of the “silent practicing” classical singers do. If you have been feeling a time-crunch or you do not feel like you are communicating powerfully through your performance, maybe it is time to redouble your interpretive efforts. The cultural, social, and historical context of the authors of the text. If you harken back to our challenge on practicing your program, you will remember how important the text is to the work we do and that it must be studied separately from the music as much as it is studied within the musical context. Therefore, the cultural, social, and historical facts surrounding the text are a wonderful place to start. Take the influence of Baudelaire on Debussy, for example. Without knowing why Baudelaire’s poetry was so innovative at the time, a singer would be unable to bring that out in the music. Drawing connections throughout the text and its place in history will imbue a singer’s performance with more power. On a more logistical note, understanding the poetic form should help with memorization as well. The compositional style of the composer as well as her interpretation of the emotional content (subtext) of the words written by the authors of the texts. Prying into the composer’s reading of the text and their subtext written into the music, is equally important. The interpretation of how the text becomes sounds is wildly different between composers based on their style. You have, no doubt, run into settings of the same text by different composers and seen this for yourself. The background, education, and experiences of a given composer can shape the sounds that they use. Sticking with the Baudelaire theme: the perception of the Earl Kim setting of Recueillement will certainly differ from the Debussy setting of the same text. Fortunately, if you are following the Day 8 challenge to sing new music, chances are that you could actually ask the composer herself about their interpretation! The singing artist’s function as the co-creator, with the composer, of the marriage of text and sound into an artistic interpretation that adds not only an audible but also a visual and kinesthetic dimension to the work. Now adding yet another layer to the interpretation is your particular interpretation for live performance. Composers give you so much information on the page, but it still will not give you everything you need to have a powerful performance of the piece. Only your own choices and decisions will give weight to those expressive points of the work. It is never about just singing what is on the page. It is always about the audible, visual, and kinesthetic choices a singer makes. Using some of that creative space, give yourself room to explore different options and make strong choices. (I should count how many times I write this on the blog:) You are never alone – you do not perform in a classical voice bubble. When you are doing your score study, do not forget about your accompanist. Listen very carefully to the musicality that your collaborative pianist is deriving from the same work you are performing. Work together to achieve that communicative power. The personal and emotional response of the audience member. As the listener perceives the performance, they are attaching their own cultural understanding and symbolism. Depending on their familiarity they will have different expectations of the musical journey. Do they have a bias to the text? Could they perceive a cultural connection to the sounds employed by the composer? Within the frame of their biases and expectations, the audience is able to experience their own humanity and this an inextricable part of the performance. Performers are able to sense when the audience is connecting with them emotionally via the reciprocation of energy. It is an amazing feeling but one that is not easily attainable. Through striving for heightened interpretation we are truly striving for this communal energy between performer and audience. Concert Song as Seen: Kinesthetic Aspects of Musical Interpretation by Sara K. Schneider. Carry on working through that stack of music for your recital with new-found insights into the interpretation. 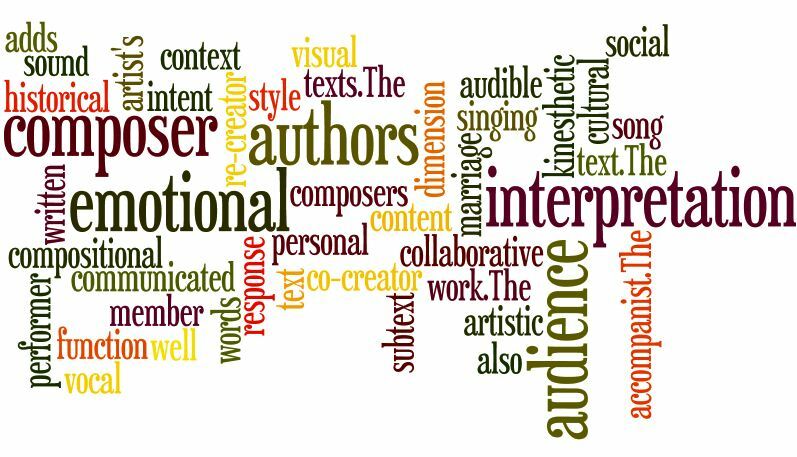 There are many layers to interpretation, starting with the poet and continuing to the composer, that will enrich your own understanding of the work. It is imperative that we work together with our collaborative accompanist to provide a space for the audience to connect with the performance emotionally. That means that the music cannot simply stop at the audible, it must also be present in the visual and kinesthetic elements of your recital. Sure it is difficult to find the time to dig deeply into the interpretation and it is downright frightening for some to approach go beyond the basic emotional elements of song (happy, sad, angry, amorous.) However, to become a diva extraordinaire, you must find the courage and the time to devote to interpretive scholarship.